Implications for paleoclimatology and Mann's hockey stick? From the “trees aren’t linear instruments and the Liebigs Law department” and the Smithsonian Tropical Research Institute, comes this story that suggests the older trees are, the less linear their tree ring growth might be, which has implications for “paleoclimatology” and Mann’s hockey stick temperature reconstructions from tree rings. The new paper Anthony was introducing wasn't about dendrochronology at all. It was a paper about how for "most species, the biggest trees increase their growth rates and sequester more carbon as they age". ...If you see a wide tree ring, you can safely conclude the tree had a good year. If you see narrow rings you can conclude a poor growth year. But was that poor year a product of an unfavorable temperature range alone? Or was it due to lack of moisture or lack of sunlight or both? Not having local records for those, how would you know? Anthony Watts: "scientists don't know nuffin'"
A large amount of tree-ring research is concerned with very localised site studies (Dean et al., 1996), necessarily reflecting the complex ecological processes that operate on small scales in forest ecosystems. Depending on the specific situation, dendrochronology can focus on the study of many different factors that influence tree growth. Examples include the following: the frequency of insect defoliation, the occurrence of severe frosts or fire, or the general competitional interactions in forest dynamics. The challenge for the tree-ring researcher is to establish an optimal representation or reconstruction of the past variability of the particular factor under study. This should involve providing realistic estimates of uncertainty, given that in practice many factors can act together to produce the changing patterns of tree growth that are measured. Anthony's specialty is not dendrochronology but doubt and disinformation. So he can't be expected to know the main points, let alone the finer points, of any subject let alone one as highly specialised as dendrochronology. And if, in some parallel universe, an Anthony Watts did know anything about trees or the study of their cross-sections, do you think he would present it honestly? The apparent paradoxes of individual tree growth increasing with tree size despite declining leaf-level and stand-level productivity can be explained, respectively, by increases in a tree’s total leaf area that outpace declines in productivity per unit of leaf area and, among other factors, age-related reductions in population density. Our results resolve conflicting assumptions about the nature of tree growth, inform efforts to understand and model forest carbon dynamics, and have additional implications for theories of resource allocation and plant senescence. For some reason this notion of increasing growth as trees get older makes me think of fractals. The bigger the tree the bigger the trunk, the more branches it has and the more it can sprout new branches. So even if individual branches grow at the same rate as branches did when the tree was younger (or even more slowly), there are more of them as the tree ages so the total mass of the tree accelerates over time. I'll be interested to read the paper itself. Supplementary data can be accessed here. It's a list of all the species studied. The fattest tree they recorded was Picea sitchensis, a conifer from North America, with a diameter of 270 cm. According to Wikipedia the trunk diameter at breast height can exceed 5 m. The supplementary data doesn't include height. The press release at ScienceDaily.com specifically mentions trees that grow around these parts, the mountain ash - Eucalyptus regnans. These trees have a phenomenal growth rate - Sadly many of the largest and oldest specimens got chopped down in times past. Liebig's Law, as it's sometimes referred to, is that growth is limited by the scarcest resource (in the case of plants, for example, by water, CO2 or soil nutrients). This is said to have been first proposed by Carl Sprengel in 1828. 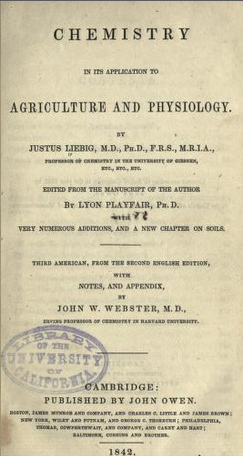 Click here for Liebig's text, which has numerous references to Sprengel. Singh, B. N., and K. N. Lal. "Limitations of Blackman's law of limiting factors and Harder's concept of relative minimum as applied to photosynthesis." Plant Physiology 10, no. 2 (1935): 245. That will have to be filled under the category” Oh Mann” with all the rest. If you read my post, Just want to know if you are seeing signs of the sun freezing your hockey stick in the ice yet? Remember my first tweet to you when you blocked me 2 years ago. Yup this is I, so many blocked how could you remember me? The biggest mstery is why anyone who claims intelligence in these matters would ever buy into the idea that temperature determines tree growth. I would think that any farmer would consider Mann a city-bred fool. I really do not see a problem for the alarmists. If the public finally realizes that the increased carbon dioxide increases the rate of growth, they can always claim that increasing temperatures cause increasing carbon dioxide. This not only wraps things up in a nice circular argument, but certainly would not affect their credibility in my estimation. Finally, someone is doing empirical research on treemometry. It comes only seventeen years after The Team ignored the obligation to do it. Once this work gets rolling, prepare to be amazed. Science will replace wishful thinking. Should be broadcast to all secondary school students. I bet it gets disappeared. They do not yet understand its implications. Another way to see that this is not universally true is simply to look at growth rings of a boll cross section. My wife and I just harvested two, a white pine and an oak, for proposes of making furniture at the cabin in Georgia. For both the hardwood and the softwood, the annual ring spacing starts large, and shrinks as the tree matures. Inner rings are more widely spaced, outer rings are quite narrow. One can measure this differential over time, and using the change over time in pi* delta r^2 (since volume is just times height, and trees reach their species typical maximum height long before maximum mass (explained by the hydraulic limitation hypothesis) can actually use calculus to work out optimum harvesting times depending on the wood sought-sawtimber or pulpwood (or, in the case of hardwood with extensive crowns, both). given, on average, rings are similar in thickness plus there is growth upwards and outwards of the canopy. Certainly if you measured 100 trees the relation would be pretty firm. Sheesh what are they teaching in botany and forestry these days that this is a new discovery. “…growth accelerates as they age suggests that large, old trees may play an unexpectedly dynamic role in removing carbon from the atmosphere.” Suggests? It is a certainty! Sheesh, what arithmetic are they teaching botanists and foresters these days. No 95% certainty among these folks. One thing for me that stood out was in ‘the team’ there was not one person who was well qualified in consider what actual effects tree growth, considering how important was to their claims . But then one thing climate ‘scientists’ have never been short of its ego and a extreme belief, against all evidenced, if their own intelligence. So perhaps they felt they did not need one. When talking of volume growth it is worth remembering that trees are fractal. The growth in tree volume can be a twig from a branch. An increase in the external sixe of the tree may not be necessary. So the limits of growth may not be reached on the lifetime of a tree. One other factor in older trees capturing more carbon is simply as they grow a trunk's and branch's circumference increases requiring more material simply to fit the next ring around the ring it's covering. In many forests like the conifer forests here in Oregon I imagine that's the primary storage area because the overhead canopy limits the growth of branches under it. Regarding picea sitchensis (aka Sitka spruce) we have one in Oregon that was 17 feet (5.2 meters) in diameter with a circumference of 56 feet (17.1 meters) and was 200 feet (61 meters) tall. Sadly windstorms in Dec. 2006 & 2007 broke off the top 120 feet (it was rather rotten from an old lightning strike site) and they cut another 40 feet off it to prevent widowmakers from falling off the splintered top. It's still an impressive 40 foot tall stump. I also wanted to comment about Liebig's Law. When I first saw that I was thinking it was some snarky comment by Anthony about the big lie. I'm glad you cleared that up. Does AW realize that Liebig's tends to wreck the "more CO2 makes all plants grow to the sky" argument? CO2 is a help in well-controlled greenhouses ... no so much in the Sahara, where corn will not be grown even if we got to 1000ppm. Agree, John. If there's anyone who hasn't figured it out by the time they get to uni or any farm management course (or medical program), it's probably one of the first things they'll learn. I'm going to try and work this as a thought experiment from the same position of ignorance as your typical climate change denier. Hmm... over the historical period there will be no significant change in tree age so no impact. In the modern polluted era with too many axes at work, tree lives will be shorter. And younger trees give less growth and so underestimate warming: so its another mechanism contributing to the decline in correlation between tree ring growth and temperature. But then we have thermometers now so who cares. Nope, nothing here that merits me a fossil fuel industry cheque. And that's me trying to work the story as a climate change denier. When nutrients are scarce, less cambium is grown and the annual rings are closer. The dendrochronologists know that was a bad year for the tree. The Siberian trees that are selectioned as a proxy for temperature are old (duh) trees whose limitating Liebig factor is temperature. When there is a long hot summer, the tree has wide rings. When the summer is cold, it's a poor year and the rings are close. It's not as accurate as a thermometer. It's a "proxy". And of course ol' Williard completely ignores why the various standardization techniques were developed. Quite aside from the Sprengel's* Law issues, Watts seems to have forgotten that there are a number of completely independent non-tree ring proxies that each describe the same hockey stick. Watts' argument is completely specious: an egregious straw man of the most logically fallacious sort. He and his ilk never seem to get around to addressing this small flaw in their story - I wonder why?